You have probably seen many types and models of step stools that can be used in the kitchen if you have been looking for one. Some of them are wooden step stools, plastic step stools, metal step stools and even folding step stools which may be a combination of metal or plastic. So which step stool do you think is best for your kitchen? That depends on the features that the step stool possesses. You may want to raise some little question like “What am I trying to accomplish in my kitchen?” This simple question plus a little bit of investigative work on the performance and quality of any step stool may lead you to choose the best step stool that will definitely work for you. Let’s take a closer look and compare the following kinds of step stools. Most step stools of this kind are of a single piece construction type. And then there are some step stools that collapse for using minimal storage space. The most common of these is the Rubbermaid brand step stool which can be easily found in many local stores, either in a hardware or department store because it is cheaper. But be wise and always check for any load rating on these step stools before taking it home with you and then find out it’s inadequate for your needs. 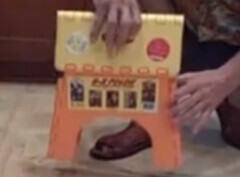 Here is another popular kind of step stool, the folding step stool. Why do you think so? Because they are the cheapest and consume very little space for storage after folded. Actually you can find this folding step stool easily in stores like Lowes or Home Depot and in department stores like Target and Wal-Mart. But anyone that should buy this kind of step stool needs to be aware for it only has a limited load rating from 150-225 pounds. With this step stool, if you are carrying something heavy and climb on it, even when you’re on the second rung and lean over, you may find yourself on the floor. This kind of step stool cannot guarantee to keep you safe because it’s not stable and sturdy. Third in the list is the metal step stool. You can choose from its various shapes and sizes offered by different manufacturers. But they all have the same problem. 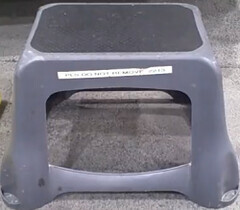 The rubber pads on the bottom of the legs that are suppose to prevent from slipping will easily wear out, making this step stool slide under you. Another flaw of the metal step stool is the welds that are holding its legs. 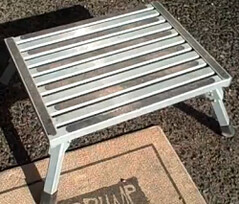 Because of the weight it constantly supports, the metal is more likely to break or bend or even crack, making this step stool unstable and unsafe. A huge liability waiting to happen. Lastly, the wooden step stool. Most people think this is the safest step stool for their kitchen. Let’s see what it will offer for safety. This step stool is smaller and lighter making it easy for the kids to drag around the kitchen. 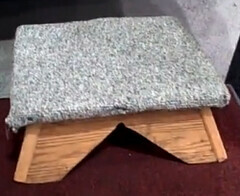 Usually it is made as a children’s step stool, thus having a max load rating of 150 pounds or so. You should see that it cannot promise safety for you if it is classified as children’s step stool. I doubt that it is stable and sturdy for an adult to use in a kitchen. Or would you like to see your kid in this photo where step stool is nowhere to be found around the house? A child opt for a dog as a step stool to reach the sink.